Abandoned by her herd, a 3 week old baby elephant was found just in time by South African truckers on their way to Botswana. 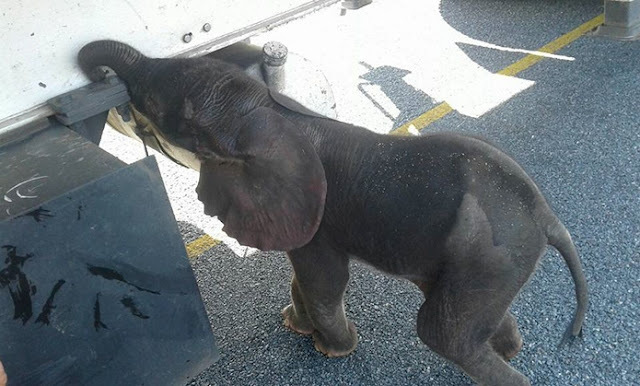 A baby elephant was found by South African truckers on their way to Botswana. The three-week baby elephant was left behind by a herd. 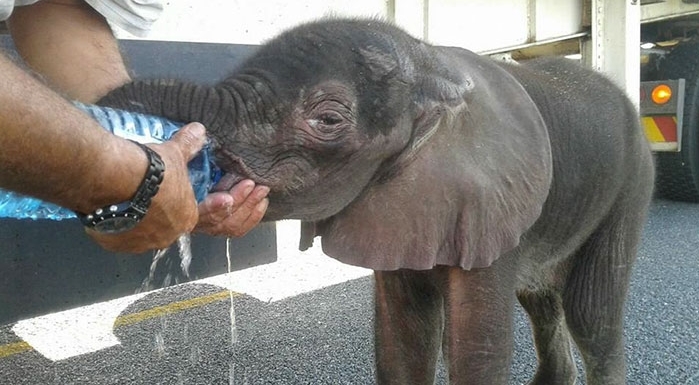 The Good Guy Things reports the South African truckers, Carlos Santos, Johan Groenewald and Pieter Roussow, were en route from Johannesburg to Nata, Botswana when they found the baby elephant. The truckers discovered the elephant when they were forced to stop 100km away from Nata because of a bridge that had washed away due to the heavy rains in the area. Nata is a village located in the northern part of the ‘Central District of Botswana’, around 900km from Johannesburg. Looking dehydrated; the truckers gave the baby elephant water and tried to search for the herd but to no avail. It is believed the little fellow was abandoned by his herd. The truckers then called the nearest animal sanctuary, loading the elephant into the truck and and delivering him to the Botswana Elephant Sanctuary once the bridge was fixed. Responses to "Abandoned and thirsty baby elephant rescued by South African truckers"
God bless this man and those who took the little one into their sanctuary. He can barely stand while feeding. I can't see the whole herd abandoning him. His mother must be dead. Sometimes to protect other babies , herd have to leave behind weak kids who can't catch up with them as they can't risk other kid's lives from attacks from lions etc.